I tell you the truth, I do not know you.—Matt. 25:12. During the great tribulation, faithful anointed ones cannot help any who had turned unfaithful. There will be no help available. It will simply be too late. What end, then, will such ones face? 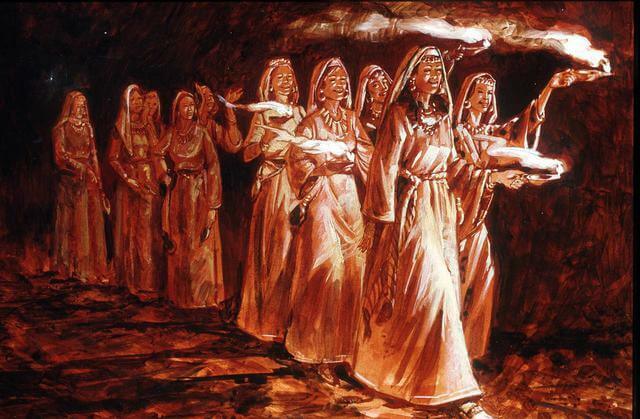 Jesus explains what happened when the foolish virgins went off on their futile errand: “The bridegroom came. The virgins who were ready went in with him to the marriage feast, and the door was shut.” When Christ comes in his glory near the end of the tribulation, he will gather his faithful anointed ones to heaven. The door will, indeed, be shut to the unfaithful ones, who prove to be like the foolish virgins. They may, in effect, cry out: “Sir, Sir, open to us!” But they receive an answer like the one that so many goatlike ones receive in that hour of judgment: “I tell you the truth, I do not know you.” How sad! This topic has been discussed on numerous occasions already, but as long as the Watchtower keeps recycling their error, I will take the opportunity to expound upon the truth. The daily text is based upon the March 15, 2015, Watchtower article entitled: Will You Keep on the Watch? The article asserts that Jesus comes during the tribulation in order to begin the judgment of Christians. Next, consider the time frame. To what time period did Jesus’ counsel apply? Jesus supplies us with a clear time indicator toward the end of the parable: “The bridegroom came.” (Matt. 25:10) As was discussed in the July 15, 2013, issue of this journal, Jesus’ prophecy recorded in Matthew chapters 24 and 25 contains eight references to his “coming”; in each case, a form of the same Greek word is used. In every instance, Jesus was referring to the time during the great tribulation when he will come to carry out the judging work and then the destruction of this world system of things. Evidently, then, this parable applies during the last days, but its climax comes during the great tribulation. The statement that Jesus comes during the great tribulation to carry out the judging work is a huge contradiction, since the Watchtower also claims that Christ came in 1914 and judged the house of God. In fact, until the July 2013 article referenced above the Society taught that the Bridegroom came in 1914 too, and that the wise and foolish virgins parted ways in 1918-19. So, for almost 100 years the Watchtower taught that the parable of the wise and foolish virgins had no future application! That is hardly an incentive to keep on the watch. Since 1995 the Watchtower has taught that Jesus’ coming with his angels to separate the sheep from the goats occurs in the future. That is most assuredly true. Yet, the verse clearly states that when the Son of man comes he will sit down on his glorious throne, which is what the Watchtower insists Jesus did in 1914. As regards the Son of man coming upon the clouds of heaven, that “coming” is after the tribulation and involves “all the tribes of the earth”; in other words, those who are outside of God’s love. And that occurs after the bridegroom comes. How can that be determined? As Jehovah’s Witnesses well know, judgment starts with the house of God first. And the fact that the coming of the bridegroom effects a separation of the wise and foolish virgins means that the foolish virgins being shut out accomplishes a judgment. If the judgment occurred in 1918, then the Watchtower would have been correct in claiming that the bridegroom came then. Of the eight references to his coming, the six other verses have to do with Jesus coming to judge his slaves, for example: “Keep on the watch, therefore, because you do not know on what day your Lord is coming.” And as has been proven over and over again that coming commences the parousia, when the master comes alongside and ministers to the faithful. Just as the Watchtower obfuscated the parable of the coming of the bridegroom for a century, so too, the coming of the messenger of the covenant has been rendered virtually meaningless. Unfortunately, my words are largely wasted. There is no earthly power that can disabuse the Governing Body from their folly. It will take the coming of Christ to do so. And it may well be that some of those considered to be the most stalwart men now might prove to be those to whom the bridegroom says: “I tell you the truth, I do not know you.” How sad!